Ohio cropland varies significantly in its production capabilities, and cropland values and cash rents vary across the state. Generally speaking, western Ohio cropland values and cash rents differ substantially from eastern Ohio cropland values and cash rents. This is due to a number of factors including land productivity, potential crop return, variability of crop return, field size, field shape, drainage, population, ease of access, market access, local market price, and competition for rented cropland in a region. This fact sheet is a summary of data collected for western Ohio cropland values and cash rents. Ohio cropland values and cash rental rates are projected to increase in 2011. According to the Western Ohio Cropland Values and Cash Rents Survey, bare cropland values are expected to increase from 7.19% to 10.11% depending on the region and land class. The "Western Ohio Cropland Values and Cash Rents" survey was conducted by drawing on the expertise of professionals that are knowledgeable about Ohio's cropland markets. Surveyed groups include farm managers, rural appraisers, agricultural lenders, OSU Extension educators, farmers, landowners, and Farm Service Agency personnel. One hundred and thirty surveys were completed, analyzed, and summarized. Respondents were asked to give responses based on three classes of land in their area: "top" land, "average" land, and "poor" land. The preliminary survey results are summarized below for Western Ohio, and regional summaries are summarized for northwest Ohio (NW Results) and southwest Ohio (SW Results). Tables show the average (Avg) (simple average) of each measure, standard deviation (Std) of the data for that measure (measure of variability), average plus one standard deviation (Avg + 1 Std), and average minus one standard deviation (Avg – 1 Std). These latter two numbers reported indicate a range within which about two-thirds of the responses in the data for that measure will fall. Survey results from western Ohio are summarized in Table 1. See Figure 1 for counties included in this survey. Survey results indicate that "top" performing cropland in western Ohio averages 193.8 bushels of corn per acre. Results also show that average value of "top" cropland in 2010 was $5,966 per acre. According to this survey, "top" cropland in western Ohio is expected to be valued at $6,280 in 2011. This is a projected increase of 5.3%. "Top" cropland in western Ohio rented for an average of $193 per acre in 2010 according to survey results. "Top" cropland is expected to rent for $211 in 2011. This equates to a cash rent of $1.09 per bushel of corn produced. Rents in the "top" cropland category are expected to equal 3.4% of land value in 2011. Survey results for "average" producing cropland show an average yield to be 159.6 bushels of corn per acre. Results show that the value of "average" cropland in western Ohio was $4,830 per acre in 2010. According to survey data, this "average" producing cropland is expected to be valued at $5,086 per acre in 2011. This is a projected increase of 5.3%. "Average" cropland rented for an average of $151 per acre in 2010 according to survey results. "Average" cropland is expected to rent for $163 per acre in 2011. This equates to a cash rent of $1.02 per bushel of corn produced. Rents in the "average" cropland category are expected to equal 3.2% of land value in 2011. The survey summary shows the average yield for "poor" performing cropland equals 128.4 bushels of corn per acre. Results also show that the average value of "poor" cropland was $3,743 per acre in 2010. According to survey data, this "poor" producing cropland is expected to be valued at $3,966 in 2011. This is an increase of 6.0%. "Poor" cropland rented for an average of $116 per acre in 2010 according to survey results. Cash rent for "Poor" cropland is expected to average $126 per acre in 2011. This equates to a cash rent of $0.98 per bushel of corn produced in 2011. Rents in the "poor" cropland category are expected to equal 3.2% of land value in 2011. *Interval is Average minus and plus one standard deviation (Std). Survey results from northwest Ohio are summarized in Table 2. Survey results indicate that "top" performing cropland in northwest Ohio averages 190.3 bushels of corn per acre or 58.8 bushels of soybeans per acre. Results also show that the average value of "top" cropland was $5,641 per acre in 2010. According to this survey, "top" producing cropland in northwest Ohio is expected to be valued at $6,031 in 2011. This is a projected increase of 6.9%. "Top" cropland in northwest Ohio rented for an average of $178 per acre in 2010 and is expected to rent for $196 in 2011 according to survey results, which equals $1.03 per bushel of corn produced. Rents in the "top" cropland category are expected to equal 3.2% of land value. Yields for "average" producing cropland average 157.5 bushels of corn per acre or 46.3 bushels of soybeans per acre. Results show that the value of "average" cropland in northwest Ohio was $4,585 per acre in 2010. According to survey data, this "average" producing cropland is expected to be valued at $4,926 per acre in 2011. This is a projected increase of 7.4%. "Average" cropland rented for an average of $139 per acre in 2010 according to survey results and is expected to rent for $149 in 2011 which equals $0.95 per bushel of corn produced. Rents in the "average" cropland category are expected to equal 3.0% of land value in 2011. The survey summary shows the average yield for "poor" performing cropland in northwestern Ohio equals 126.4 bushels of corn per acre or 35.6 bushels of soybeans per acre. Results also show that the average value of "poor" cropland was $3,534 per acre in 2010 and is expected to average $3,772 per acre in 2011. This is a projected increase of 6.7%. "Poor" cropland rented for an average of $104 per acre in 2010 and is expected to average $112 per acre in 2011 according to survey results which equals $0.89 per bushel of corn produced. Rents in the "poor" cropland category are expected to equal 3.0% of land value in 2011. 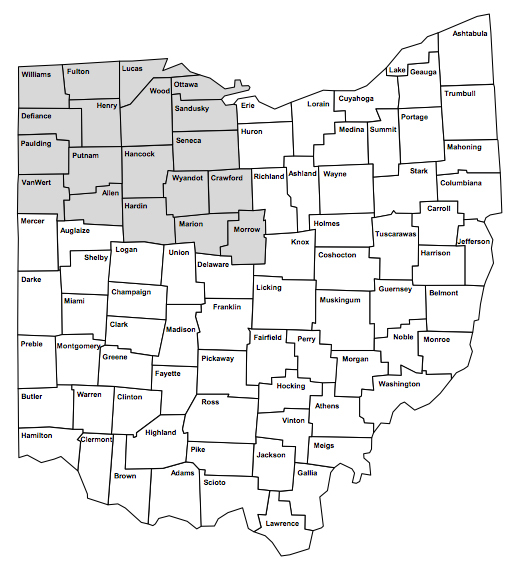 The northwest region for the purposes of this survey includes Williams, Fulton, Lucas, Ottawa, Defiance, Henry, Wood, Sandusky, Paulding, Putnam, Hancock, Seneca, Van Wert, Allen, Hardin, Wyandot, Crawford, Marion, and Morrow counties. See Figure 2. Survey results from southwest Ohio are summarized in Table 3. Survey results indicate that "top" performing cropland in southwest Ohio averages 197.9 bushels of corn per acre or 61.7 bushels of soybeans per acre. Results also show that average value of "top" cropland was $6,330 per acre in 2010. According to this survey, "top" producing cropland in southwest Ohio is expected to be valued at $6,560 per acre in 2011. This is a projected increase of 3.6%. "Top" cropland in southwest Ohio rented for an average of $209 per acre in 2010 and is expected to rent for $227 per acre in 2011 according to survey results which equals $1.15 per bushel of corn produced. Rents in the "top" cropland category are expected to equal 3.5% of land value in 2011. Yields for "average" cropland equal 162.0 bushels of corn per acre. Results show that the value of "average" cropland in southwest Ohio was $5,111 per acre in 2010. According to survey data, this "average" producing cropland is expected to be valued at $5,270 per acre in 2011. This is a projected increase of 3.1%. "Average" cropland rented for an average of $165 per acre in 2010 and is expected to rent for $180 per acre in 2011 according to survey results which equals $1.11 per bushel of corn produced. Rents in the "average" cropland category are expected to equal 3.4% of land value in 2011. The survey summary shows the average yield for "poor" cropland in southwestern Ohio equals 130.9 bushels of corn per acre. Results also show that the average value of "poor" cropland was $3,988 per acre in 2010. According to survey data, this "poor" producing cropland is expected to be valued at $4,194 per acre in 2011. This is an increase of 5.2%. "Poor" cropland rented for an average of $129 per acre in 2010 and is expected to average $142 per acre in 2011 according to survey results which equals $1.09 per bushel of corn produced. Rents in the "poor" cropland category are expected to equal 3.4% of land value in 2011. 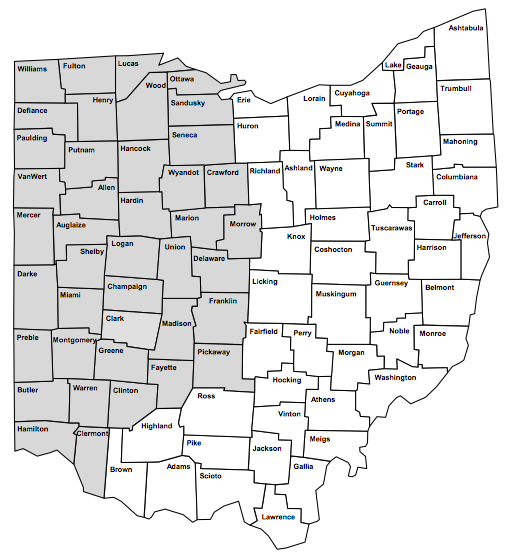 The southwest region for the purposes of this survey includes Mercer, Auglaize, Shelby, Logan, Union, Delaware, Darke, Miami, Champaign, Clark, Madison, Franklin, Preble, Montgomery, Greene, Butler, Warren, Hamilton, Clermont, Clinton, Fayette, and Pickaway counties. See Figure 3. Table 4. Average estimated Ohio land value per acre (tillable, bare land), per bushel corn and soybean yields, by geographical area and land class, Ohio Cropland Values and Cash Rents Survey 2010–11. Table 5. Average estimated Ohio cash rent per acre (tillable, bare land), per bushel corn and soybean yields, by geographical area and land class, Ohio Cropland Values and Cash Rents Survey 2010–11. Survey respondents were asked to give their best estimates for long-term land value and cash rent change as well as projections for mortgage and operating loan interest rates for 2011. The average estimate of cropland value change in the next 5 years is an increase of 7% (for the entire 5-year period). There was a large range in responses from survey participants for cropland value change in 5 years. Responses ranged from an increase of 25% to a decrease of 50%. The average estimate of cash rent change in the next 5 years is an increase of 7.87%. There was a large range in responses from survey participants for cash rent change in 5 years. Responses ranged from an increase of 25% to a decrease of 50%. The summary of these responses is presented in Tables 1 through 3 and includes Value of Cropland in Transition 2010 and 2011 (areas where much of the land is moving into residential, commercial, and industrial uses), Expected Percent Change in the Value of Bare Cropland in the Next 5 Years, Expected Percent Change in the Cash Rental Rates in the Next 5 Years, Expected Average Interest Rate for Mortgage Loans for 2011, Expected Average Operating Loan Rate for 2011, Pasture Cash Rent per Acre, and the Value of Pasture Land. Tables 1 through 3 below show the results of the survey for these measures for western Ohio and two subregions (northwest and southwest) of Ohio. Also, check with your local OSU Extension office for local land value/rental survey summaries. For additional information on farmland lease issues see the Department of Agricultural, Environmental, and Development Economics (AEDE) Farm Management webpage at: aede.osu.edu/research/osu-farm-management/publications. Special thanks to Lynn Forster for his helpful comments on this paper.